Netanyahu as Prime Minister - Déjà Vu? 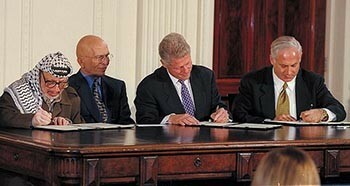 Forgotten by many, Binyamin Netanyahu (r) signed the Wye River Accord with Yasir Arafat (l) in October 1998. With Binyamin Netanyahu, head of the Likud Party, about to become Israel's next prime minister, one wonders whether he will stick to his more controversial campaign promises – not that of confronting the Iranian threat, which is widely backed, but such as ending Hamas control of Gaza or keeping the Golan Heights. Two indicators suggest what may lie ahead: (1) the general pattern of the four Likud prime ministers since 1977 and (2) specifically, Netanyahu's own record as one of those four. Levi Eshkol (p.m. 1963-69) once acknowledged the deceit of Israeli politics: "I never promised to keep my promise!" In this spirit, three out of the four Likud leaders campaigned right and governed left, breaking their campaign promises not to retreat from territories Israel seized in 1967. Menachem Begin (p.m. 1977-83) was elected in 1977 on a nationalist platform that included annexing parts of the West Bank; he instead removed all troops and civilians from the Sinai Peninsula. Yitzhak Shamir (p.m. most of 1983-92) ran on a platform against giving land to Arabs and kept his word. Netanyahu (p.m. 1996-99) promised to retain the Golan Heights but nearly traded away that territory; opposed the Oslo accords but ceded more control in the Hebron and Wye accords to the Palestinian Authority. Ariel Sharon (p.m. 2001-06) won the 2003 elections arguing against a unilateral withdrawal from Gaza, then did exactly that, withdrawing all troops and civilians. Surveying Likud's history, Nicole Jansezian notes with irony at Newsmax that "While Palestinian, American and European leaders worry how Israel's shift to the right will negatively impact the peace process, perhaps the only ones who need to fear an Israeli right-wing government is the Israeli right wing." Shamir's opinion of Netanyahu plummeted after watching his actions as prime minister, seeing him by 1998 as willing to do just about anything "to continue to be elected and to hold on to the seat of prime minister." I went through a similar process of disillusionment, celebrating Netanyahu's accession in 1996 but so soured on his lack of principles that I reluctantly preferred his Labor opponent in the 1999 elections. What now, as Netanyahu prepares to take office again? Neither his party's history, nor his own biography, nor his character, nor murmurs coming out of Israel suggest that he will keep his electoral promises. Indeed, Netanyahu already flunked his first test: after 65 of Israel's 120 members of parliament informed President Shimon Peres that they supported Netanyahu for prime minister, Peres on Feb. 20 gave Netanyahu a chance to form a government. Netanyahu proceeded to ditch those allies in favor of forming a "national unity" government with leftist parties, notably Kadima and Labor. He even announced that his biggest mistake in 1996 had been not to form a government with Labor: "In retrospect, I should have sought national unity, and I'm seeking to correct that today." Kadima and Labor appear to have decided to go into the opposition, foiling Netanyahu's plans. But that he preferred a coalition with the left reveals the lightness of his campaign statements. Along these lines, when asked by an interviewer, "You're not the right-wing hawk they describe in the papers?" Netanyahu proudly recalled the betrayal of his promises in the 1990s: "I'm the person who did the Wye agreement and the Hebron agreement in the search for peace." On the Golan Heights, diplomacy has apparently begun. U.S. Secretary of State Hillary Clinton says the importance of Syria-Israel talks "cannot be overstated." Despite Netanyahu's ostensibly rejecting these negotiations, a close aide observed that a breakthrough with Damascus offers a way to curry favor with the Obama administration and Netanyahu would expect Washington in return "to give him a break with the Palestinians." Insiders assure me Netanyahu has matured and I hope they are right. But a Likud leader observed while watching the coalition talks, "Bibi is selling everything out to the coalition partners. He doesn't care about us. He only cares about himself." Similarly, Netanyahu's opponents expect him to pursue his personal agenda: Yaron Ezrahi, a political scientist at Hebrew University, says Netanyahu has little compunction "in sacrificing an ideological position as long as it keeps him in power." Even as I hope to be pleasantly surprised, familiar patterns do make me worry. Mar. 20, 2009 update: For updates on this topic, see "Will Netanyahu Keep His Word?" Related Topics: Israel & Zionism | Daniel Pipes receive the latest by email: subscribe to the free mef mailing list This text may be reposted or forwarded so long as it is presented as an integral whole with complete and accurate information provided about its author, date, place of publication, and original URL.